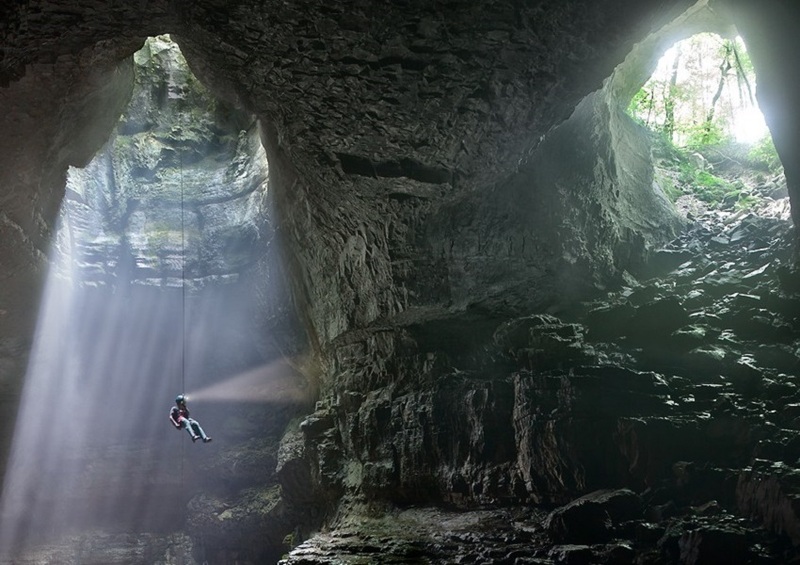 The bottom of the entrance pit can only be reached using vertical caving skills, knowledge, and equipment to safely descend by rappelling a rope and ascending that same rope with specialty equipment to exit the cave. The bottom of the entrance pit is 143 feet below the edge. If you do not possess vertical caving skills, ability or experience needed to safely visit the bottom of the pit, Stephens Gap is still an impressive and unique place to visit and the short walk-in passage alone may be worth the hiking effort. Please be careful – the trail is primitive and can be steep and slippery. The walk-in passage intersects the pit about 50 feet above the floor; therefore, extreme caution should be exercised close to the edge as footing can be uncertain. Camping is only allowed on the bluff above the pit entrance (no camping in the parking area); there is only room for two small tents; conditions are primitive (no electricity, water or toilets) and all waste must be packed out. Add camping to your permit request’s itinerary if you’ll be staying overnight. When you visit the preserve, please place your permit on the dashboard of your parked vehicle while you are visiting the preserve. ¾ mile. Can be very slippery when wet. Yes - Surface Only. Please clean up after your pets.